Keyboard commands can save you time and energy speeding during a Linear document review or or efficiently use your computer without a mouse. From the Document Viewer page you can move forward through controls using some keyword commands, whether you are or are not a power user. 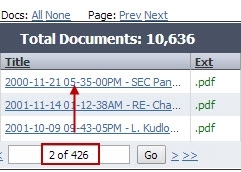 When you click on the 'Title' of a document the Document Viewer page will open the full document view, and also a listing of up to 25 of the documents displayed in those pages will be carried over. Code the first of the 25 documents listed, and then use the shortcuts listed in the table (below). For example, if you want to move to the next document instead of clicking on 'Save' button and 'Auto-Advance' check-box, you can use the keyboard shortcut 'Alt+S'. Please find below a table of keyboard and mouse shortcuts inline with the Document Viewer page, as used in Firefox, Google Chrome and Internet Explorer (IE10), and Safari as used in Windows. Lexbe supports the two most recent browser versions of Internet Explorer and Firefox for the Windows and Safari and Firefox for the Mac. Please note that the keyboard and shortcuts can vary depending on platform you use. For example, on Mac OS X the 'Cmd' key is the '⌘' symbol, as oppose to Windows that uses 'Ctrl' key. In Windows 'Alt' key could be either 'Cmd' or 'Opt' keys in Mac OS X.